Scandinavia is beautiful, including the landscape, the architecture and the women (it truly is the Land of the Midnight Blonde). It’s also the most expensive place I have ever been, outside New York City and Tokyo. The difference in NYC and Tokyo is that you can still manage to find some things that are reasonably priced if you do some looking around. I haven’t spent that much time up here, but I don’t think that is the case here. It’s just all expensive. Everywhere. Bigger cities or small towns. Some examples, you ask? Well, sure. In Oslo, Norway, my bed in a four-bed hostel dorm room cost the equivalent of about $70 U.S. dollars. I had a reasonable, but not exquisite, Indian dinner that night with one beer. Cost = $50 U.S.
On the train from Trondheim north to Bodo, the beers were $10, the hot dogs were $5 each and a cup of coffee was $4. It was an overnight train and in the morning I ended up talking the woman behind the counter to give me a free refill on my coffee, to amortize my cost down to $2 a cup. It felt like a great accomplishment. I walked by a Burger King in Trondheim. The cheeseburgers were $3 each. The Whooper meal (Whooper, fries and a drink) would run you $12. The Snickers bars were $4 each at the train station. I ate a $10 basic ham and cheese sandwich for dinner. I passed on the $10 beer, which wasn’t even a full liter, but 6/10s of one. I got in late to Trondheim and got stranded there, so I had to get a hotel room. The first room I asked about was $220. The Comfort Inn was only $190. I managed to find a place for about $100. By the way, here is how I got stranded. Once again, I screwed up. In Oslo, I was doing some research on how to get all the way north to Hammerfest, the supposed northernmost city in the world. The guidebooks say there is a thirty-hour bus from Oslo to there, but I asked the bus companies when I got in and none of them go that far north. In fact, they don’t even go to the middle of the country. 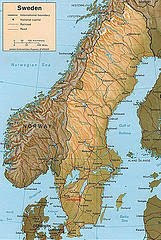 The Norwegian train system would get me about halfway up Norway, to the town of Bodo. The train information people then said that they thought I could catch three or four local buses up to Hammerfest. They also said that if I bought the train ticket from them, it would cost about $200, but if I used the self-service machine that I’d be able to get the ticket much cheaper. They were right, I got it for about $50 from the machine. The problem was that I got it for the wrong day. I thought I was leaving the next day (the 28th), but I inadvertently must have punched the 29th instead. I didn’t notice until I was on board the first train, which went half way there, to Trondheim. The conductor said my ticket was find and let me stay on the train. I wasn’t so lucky on the second, overnight train from there to Bodo. That conductor said I was traveling the wrong day and wouldn’t let me keep going. Therefore, an expensive overnight in Trondheim. Luckily in the midst of this, I hooked up with a wonderful guy from Norway that helped work out my muddled travel plans. I stopped in Bodo to buy some groceries at a local store to take onto the ship I am on for three nights and four days, taking me to the very top of Norway and dropping me off near Russia. I figured that I would buy most of the food that I would eat on the boat there, to save as much money as I could, seeing as the boat fare more than ate up my daily budget (almost exactly $500 for the three nights). • five hundred grams of grapes. Thank God I didn’t start my trip here, before I had any idea about cost control. My good friend, the Aussie Nomad has written about expenses in Sweden, which might, might just be even worse. On the train ride today up to meet the boat in Bodo, I experienced another first for me: first time across the Arctic Circle. Right about that time, I also came to the full realization that I am a tad bit underprepared for the weather I am likely to experience the next few weeks. There is snow on the ground up here. It’s not covering everything yet, but in the areas that the train went through that did have snow, it was not just a light dusting. I remember when I was very young and I lived in Wisconsin, which I still consider the far north, we’d all wonder if it would snow by Thanksgiving. Well, its still September here. I’m not at any sort of elevation that would bring the cold earlier. It’s the end of September and its simply cold. Not frigid cold, but still see-your-breath in the middle of the day cold. It wasn’t snowing in Bodo this afternoon. . . it was sleeting as I boarded the ship. One fleece that I bought in Germany. One sweater that I bought in Peru. That’s all I’ve got. I really do not want to buy any more warm clothing – it takes up lots of room in my backpack (though I’d probably just be wearing it every day) and I’d just have to give it away in a few weeks, when I turn back to summer. I had multiple goals on this trip, but I think that the “12 months of summer travel” has run headfirst into “southernmost and northernmost city on the same trip.” You can’t mess with Mr. Freeze Miser. Then again, it did give me an idea for another book. If I can get the first one published. Very useful report for me, I am planning quite a similar trip. Thanks for the blog. I wonder how much did you spend for the cruise trip ? Did those groceries make up all your meals in the voyage ? How much more did you spend for food on board ?